Several days ago Scientific American published a very balanced article ("Hawaii First to Harness Deep Ocean Temperatures for Power") on the recent inauguration and purpose of Makai Ocean Engineering's grid connected 100 kilowatt ocean thermal energy conversation (OTEC) plant at the Natural Energy Laboratory of Hawaii Authority (NELHA) near Kona Airport on Hawaii Island. 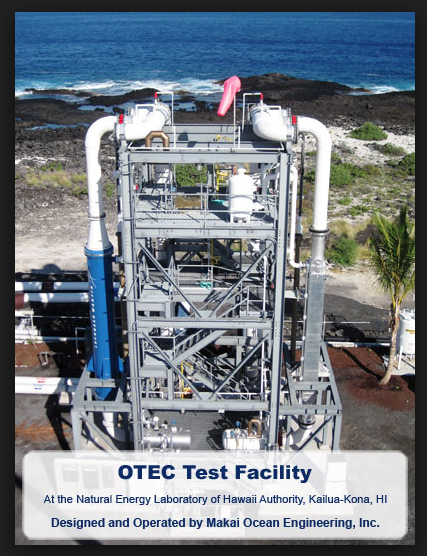 The article does a great job on explaining how the technology works and the purpose of the project to investigate and better understand the challenges of scaling up OTEC projects to become a commercially viable and a cost-effective resource and technology. 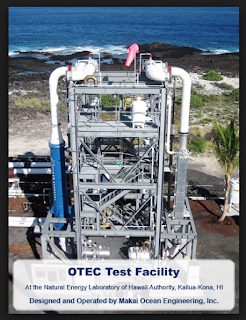 For all those OTEC advocates criticizing HECO for not using OTEC, simply put, OTEC is not ready for prime time. Utility Dive writer, Herman Trabish, covers the University of Hawaii Economic Research Organization's (UHERO) new report, "Efficient Design of Net Metering Agreements in Hawaii and Beyond," in his article entitled, "Is variable pricing the way out of Hawaii's solar wars?" This UHERO report along with an earlier February 11, 2013 policy brief entitled, "Tax Credit Incentives for Residential Solar Photovoltaic in Hawaii," help to validate the position Dr. Marco Mangelsdorf and I write about in our July 6, 2015 opinion piece, "It's Time to End Net-Energy Metering in Hawaii."